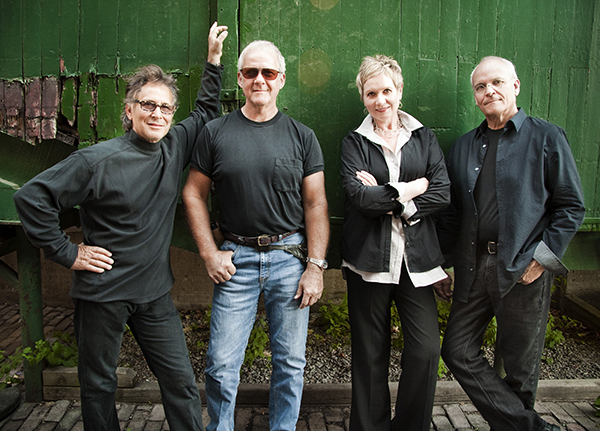 Lunch At Allen’s is an extraordinary musical revue by internationally renowned artists, Murray McLauchlan, Cindy Church, Marc Jordan, and Ian Thomas who perform together as a band — the stage show is an intimate and humorous performance by some of Canada’s finest individual performers. It all began as a regular get together at Allen’s Pub & restaurant on The Danforth in Toronto with Canadian music icon Murray McLauchlan and old friends Ian Thomas and Marc Jordan. After adding the voice of Cindy Church, a “lunch at Allen’s” turned into an outstanding band performing some of Canada’s (and the world’s) most enjoyed songs from each of these songwriters’ impressive catalogues. Marc Jordan and Ian Thomas’ songs have been recorded by everyone from Rod Stewart to Bette Midler, and Diana Ross to Santana. Murray McLauchlan’s hits have covered Canadian airwaves from coast to coast. Cindy’s (the sweetest) voice and songs are well known on the folk festival circuit through her solo work and as a member of Quartette with Sylvia Tyson. Together, it seems as though they’ve been playing for years with an energy and freshness like they’ve just met. The irreverence of friends who make exceptional music together during a magical Lunch At Allen’s is enjoyed by audience members while the group is on tour. They have been busy recording a new album, “…more Lunch At Allen’s,” going on tour and writing new material, while all maintaining their own individual musical careers throughout the year. Lunch at Allen’s has two previous albums they have recorded since coming together. Their original recording “Lunch At Allen’s” was also a full-length video, and their second cd offering, “Catch The Moon,” were both well-received by fans and critics alike.